CPO Editorial: This is a reproduction of an original article posted June 27th, 2018 on Indiewire, and written by Tom Brueggemann. 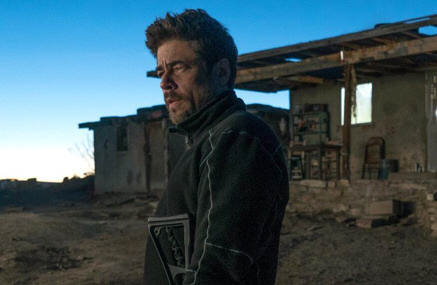 Tom gives a quick overview of the history of sequels in general, and looks at June 2018's "Sicario: Day of the Soldado in particular". Like almost every other movie this summer, "Sicario: Day of the Soldado" is a sequel. However, it bears little resemblance to the onslaught of overgrown lizards, animated families, and Marvel brethren; it cost much less, and will gross much less. But what really sets "Soldado" apart is it was never meant to happen. Sequels are as old as the movies. Comedy silent shorts often built on a continuing set of characters. Rudolph Valentino followed "The Sheik" with the even-bigger "Son of the Sheik." Douglas Fairbanks went from "The Mark of Zorro" to "Don Q, Son of Zorro." In the early decades of sound, studios nurtured franchises that included The Thin Man (six titles), the Hardy Family (16 titles), Dr. Kildare (16 movies, plus radio and TV series) and Ma and Pa Kettle (10 titles). Rarely, studios struck twice on a major success: 1944 Best Picture winner "Going My Way" immediately spawned the even-better "Bells of St. Mary's," and 1942 winner "Mrs. Miniver" spawned "The Miniver Story" in 1950. Sequel power intensified in the 1960s, when United Artists launched the James Bond films, the Sergio Leone Italian westerns, and the Pink Panther films. However, studios still viewed sequels as the exception rather than the rule until 1974, with "The Godfather Part II." Released in 1972, "The Godfather" was a massive popular success that won three Oscars, including Best Picture. Two years later, its sequel was a hit; it also became Hollywood's first studio movie with a title followed by a number. Among those that followed were "The French Connection," "American Graffiti," "Jaws," "The Poseidon Adventure," "The Sting," and "Rocky." Even "2001" led to "2010." Today, most expensive movies are made only because they have sequel or franchise potential, limiting interest in dramas and other standalone projects. The global nature of movies makes familiarity an asset and originality often a detriment. All of which makes "Sicario: Day of the Soldado" very rare indeed: a wide-release sequel for a film that cost $30 million and made $89 million worldwide (adjusted). Those numbers aren't embarrassing, but they're only modestly profitable - and they certainly aren't the stuff of self-evident sequels. The original "Sicario" was an independent production acquired by Lionsgate at Cannes 2014, shortly before production began in New Mexico. It premiered at Cannes 2015 to much acclaim and, following a two-week New York/Los Angeles platform launch, opened in 2,620 theaters where it faced the opening weekend of "The Martian." Opening to $13 million, it went on to achieve a nearly four-times multiple. It also became an awards-season contender with reviews better than several of the Oscar Best Picture nominees like "The Big Short" and "The Revenant." Ultimately, the film earned three craft nominations, including Roger Deakins for cinematography. Positive word of mouth set it up for above-average home viewing interest, especially with a plot that wouldn't have been misplaced on premium streaming: lawmen on both sides of the border fight drug cartels, with higher production values and stellar performances. It also made a name out of respected Quebecois auteur Denis Villeneueve, who went on to direct "Arrival" and "Blade Runner 2049." Similarly, screenwriter Taylor Sheridan later wrote "Hell or High Water" as well as writing and directing "Wind River" and the new Paramount Network TV series "Yellowstone." For the sequel (Lionsgate sold domestic rights to Sony), Sheridan is back along with leads Josh Brolin and Benicio del Toro, but not co-lead Emily Blunt. She was a standout in the first film, but chose to make the sleeper hit "A Quiet Place" and take on "Mary Poppins Returns." Also missing is Deakins; he's replaced by the well-regarded Dariusz Wolski, Ridley Scott’s DP on "The Martian" and "All the Money in the World." But it is the choice of Stefano Sollima as director that suggests why this sequel was made. He's virtually unknown in this country; if he's familiar, it's from "Gomorrah," the Sicilian mafia TV series he largely directed (based on a 2008 movie) that is now a Netflix hit. "Sicario: Day of the Soldado" has a sensibility that suggests an eye toward creating a franchise. While reviews are only modest this time, Sollima is credited with attention-grabbing story elements that could recur in future efforts. The film is a U.S./Italian coproduction, with an international release that has most territories also opening this week. It's another case of World Cup impact: There's room on the calendar because studios are avoiding releases in the month-long period. Domestically, "Soldado" is expected to open to under $20 million, but at a higher level than its predecessor's wide opening. The wager is, even if the domestic take ends up around the same $50 million, foreign interest will rise. Those who despair at the bludgeoning dominance of sequels in studio release schedules might take heart in "Soldado." It won't return us to the era of "Casablanca" or "Rear Window," when one great movie was enough, but it might suggest that original thinking can provide to find rich ore.